In Stolin took place a Belarusian Oyama Karate Kata Cup. The competition was organized by the “Saiha” club with its leader, sensei Igor Yurkevich 2nd dan. 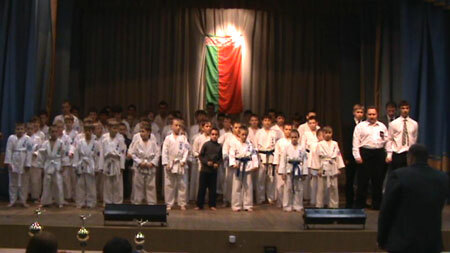 75 sportsmen, aged 8-17 years, took part in the tournament. White belts: Bakaldin Aleksey, “Businka”, Rogachev. White belts: Kunai Nikolai, “Saiha”, Stolin. Blue belts: Podenkova Mariya, “Businka”, Rogachev. Yellow and orange belts: Karpinsky Vadim, “Saiha”, Stolin. White belts: Leonovets Valery,“Saiha”, Stolin. Blue belts: Vishnevsky Dmitry,“Saiha” , Stolin. Yellow and orange belts: Kim Ilya, “Saiha”, Stolin. The first prize for the best club was won by the “Saiha”, Stolin; the second place went to “Businkan”, Rogachev; and the third prize to “Taipan”, Zhlobin. During the competition, Sensei Yurkevich, the official country representative of OYAMA IKF in the Republic of Belarus, handed the black belt certificates. The first dan was given to Savostyanchik Aleksander (the director of “Businkan” club, Rogachev) and to Rovkach Mihail (“Saiha” club, Stolin).